Stenhousemuir put in a solid performance but were ultimately out-gunned as they lost 3-0 to Championship side Morton in their first pre-season test of the summer. A new look Stenny line-up gave their opponents plenty to think about, with Brown Ferguson’s men looking particularly organised in defence- even if the scoreline suggests otherwise. That view was echoed by the Ochilview chief: “It was good to get all the players out playing, getting them up to speed but also bedding in some of the defensive principles we’ve been working on. The first clear cut opportunity of what was a fairly subdued first half came in the 12th minute for the visitors. Lewis Strapp’s ball looked to have been easily dealt with by Chris Smith, before Bob McHugh intercepted, rounded the keeper and produced a bursting shot that required a last gasp clearance from David Marsh. In the 29th minute Lewis Strapp was replaced by Mark Russell after a clash of heads with Ross Meechan. The substitute was soon at the centre of things- setting up the opener for Jim Duffy’s side on 38 minutes. Bob McHugh latched onto his pass, set himself up and rocketed an effort straight into the left hand corner of the net. Brown Ferguson made a raft of changes in time for the second half, and the replacements held out until just before the hour mark- when Morton grabbed their second goal of the affair. New signings Gary Harkins and Bob McHugh combined to pick out Robert Thomson, whose headed effort went straight into the left hand side of the goal. 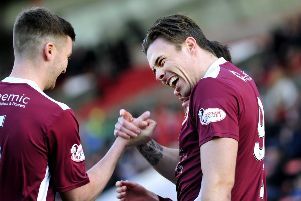 The closest Stenny came to getting on the scoresheet came as a result of a bizarre defensive lapse from Morton’s backline. Keeper Derek Galston tried to play a simple one-two pass back to defender Darren Hynds, but ended up blasting it straight off Mark McGuigan on the goal-line before Galston recovered the ball and somewhat spared his blushes. Morton’s third and final goal came on 70 minutes- when substitute Ben Armour took advantage of the ball being bandied around the penalty box, before slipping an effort into the back of the net.